Both of my “Labors of Love” are 1 Month Old! 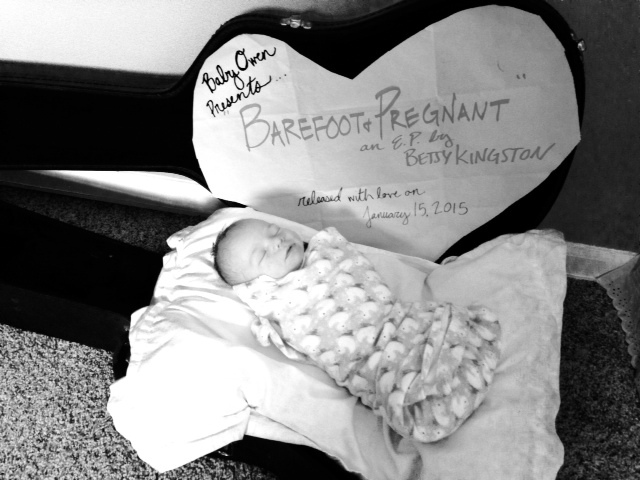 Baby Owen being 1 month old means that it has been one month since I hit the release “button” on my EP, “Barefoot & Pregnant.” (Side note, I officially released it when I went into labor, which was the day before he was born instead of the actual date… bummer!) I sing a couple of the songs to Owen when I’m trying to calm him, and I like to think he already knows the words from helping me create them in the womb… Maybe? Anyway, it works. As far as non-baby reactions go, I have been completely humbled hearing how much people have enjoyed the songs. I had a blast working on them and recording them, and while I intended to do so much more (like make a music video — how funny would that have been?! ), it feels good to have these 4 songs completed and out there! If you’ve had a chance to take a listen, please hit me up with your feedback – I’d love to hear from you, especially since my adult-interaction has been severely limited for the past month! 😉 And if you haven’t had a chance to take a listen, please do! “Barefoot & Pregnant” is available through just about any digital vendor you can think of, so take your pick!